I’ve been so busy for the last couple of weeks, that it wasn’t until now I realized that part two of Nemi Maharajas posts on Priya narma sakhas had already been published. I had seen the post, but mistakenly thought it was the first post. So joy! There was something new for me to relish. I found part 1 to be a bit of a rehash of old argument,where Nemi Maharana continues with that priya narma sakhas is in sakhya rasa. Nobody disagrees with this, so I don’t understand the need to argue this point. But still – it’s siddhanta and all good. As mentioned previously, the first posting have a very interesting development. It was the first time we see that the madhurya-rati side aknowledges that Gurudeva have never specifically stated SP is a manjari, but instead uses describing words like gopi-bhava etc. This is a progression of understanding as the madhurya-rati side now moves away from the idea that Gurudeva lied to us and that he was duplicitous. Instead, there’s an understanding that there is room for interpretation of Gurudevas words. Of course, the madhurya-rati side claims there is nothing there to interpret. The second part of Nemi Maharajas postings is where it gets interesting for me. Previously in this debate, I found the madhurya-rati sides arguments to be weak and not really understanding or even approaching the claims made by the sakhya-rati side. At times I even wondered whether they had even read any of KBMs statements, the public statement suggest they didn’t. This changes with the current postings by Nemi Maharaja where in the second posting he goes into the following question: Can priya-narma-sakhas enter into madhurya-rasa so deeply that terms such as “madhurya-rasa”, “gopi-bhava” and “maidservant” can legitimately be applied to them? This goes into the heart of the matter and requires a deep understanding of the function and moods of Priya narma sakhas. “Radha -krsna-ganoddesa-dipika, Ujjvala-nilamani, Jaiva-dharma and Prema-pradipa all give this indication”. I would love to get the exact reference, because in BRS it says that the primary rasa cannot disappear, while KBMs statement indicates this. So there we have an inconsistency that needs to be addressed. Again, I need a better source to reference of Bhakti Rasamrita sindhu, but still this does address an interesting question. How much a part is the madhurya rasa in pns? My understanding is that it’s not part of their permanent relationship. The priya-narma-sakhas’ sthayi-bhava is angi-rasa. And madhurya-rasa is anga. When anga-rasa is mixed with angi, that anga-rasa should increase the taste of rasa. Otherwise, that anga-rasa (madhurya-rasa) becomes useless. So, how to understand this (because I don’t)? Again, this is a point that need to be further clarified by the sakhya-rati side. Next Nemi Maharaja goes into the claim that pns assist in the intimate amorous pastimes (what is Rkgd?) The lovely thing is that now we really have to reference the verses that are being used. This goes into the the claims that pns are not manjaris. The sakhya-rati side does not claim that pns are manjaris, but there is still a piece missing from the puzzle: what is the difference in service between pns and manjaris when pns can get a shadow of mahabhava? KBM have statement that only touches upon the subject, but doesn’t really dive into it. What I’m also wondering about is if there are divisions within the priya-narma sakhas, because KBM specifically states that SP is a follower of senior pns. What of pns who follow not senior pns? So, I think Nemi Maharaja has pointed out an inconsistency in the understanding of siddhanta that needs to be addressed. Furthermore, there is a piece of the puzzle missing in the sakhya-rati side which is to explain in further detail the difference between manjaris and PNS like Srila Prabhupada. 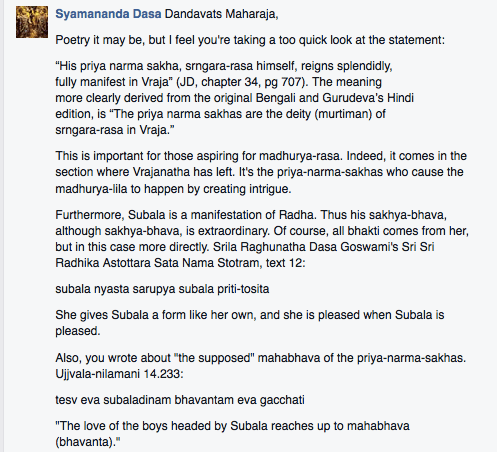 Syamananda prabhu pointed out to me that Nemi Maharaja argues against Damodar Maharaja in this post and not KBM. This is a very good way of circumventing any vaishnava aparadha one might make when one has a differing opinion from high class devotees like Krishna priya didi and Madhusudhana Maharaja. Nemi Maharaja argues siddhanta with an equal instead. If I ever go into a disagreement with my seniors, I hope I will use his example. Therein is the quote from Jiva Goswami’s UN commentary, saying that the male mood of the priya-narma-sakhas gets covered by sakhi-bhava. That the sakhya-bhava “disappears” doens’t mean that it’s non-existent, just non-apparent. extent.” (JD chapter 30, 625). become either vatsalya rasa or madhurya rasa.” (Premapradipa). suhrt sakhas go to vatsalya rasa side. “When vibhava is added, then dasya-rasa is awakened. Dasya-rasa is of two kinds siddha-dasya and unnati-garbha. In siddha-dasya, dasya is the limit. In unnati-garbha-dasya, sakhya, vatsalya, and madhurya rasas germinate. “In this way sakhya is of two kinds siddha and unnati-garbha. In siddha-sakhya, rati, prema, and pranaya are found to be steady. In unnati, vatsalya and conjugal feelings germinate.